Something that’s kind of odd, but not even that surprising: Usually WordPress intercepts 30-40 spambot comments on this blog in any given day. In the days since I published my piece on the death of my beloved pug-dog Mavis, that has dropped to three or less a day. Even the bots realize there’s little return in inserting your online casino ads under a sad story. I didn’t know they paid that much attention. But now I’m imagining a bunch of sad spambots sitting around morosely, playing mumbledy-peg or solitaire to fill in their idle hours. I guess I really should give them something to try to post under. 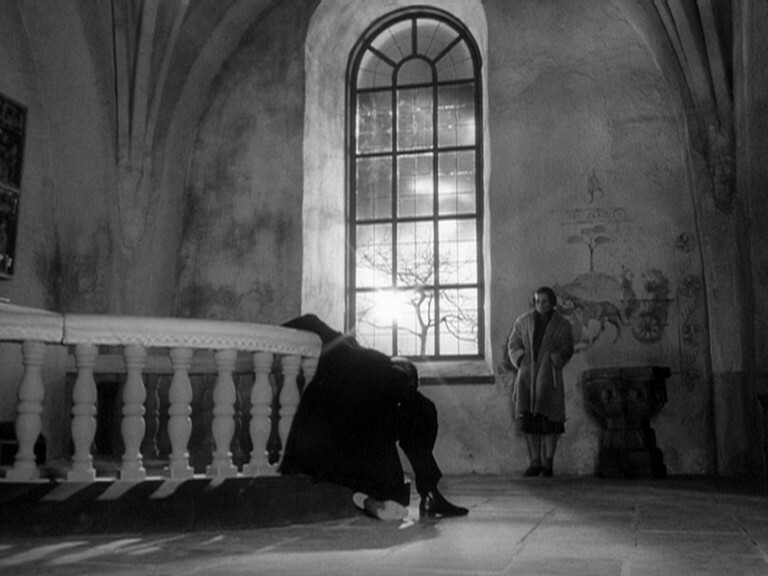 After the hell of that week, when I finally elected to watch a movie, I was of two minds: escapist fare, or something that had been on my Watchlist forever, and was one of Roger Ebert’s Great Movies: Ingmar Bergman’s Winter Light, which is the exact opposite of “light escapist fare”. Also, by “forever” I mean “since I watched The Seventh Seal last year and decided to fall in love with Gunnar Björnstrand, who played the squire, Jöns. Björnstrand here plays Tomas Ericsson, the pastor of a Lutheran church in a small fishing town. 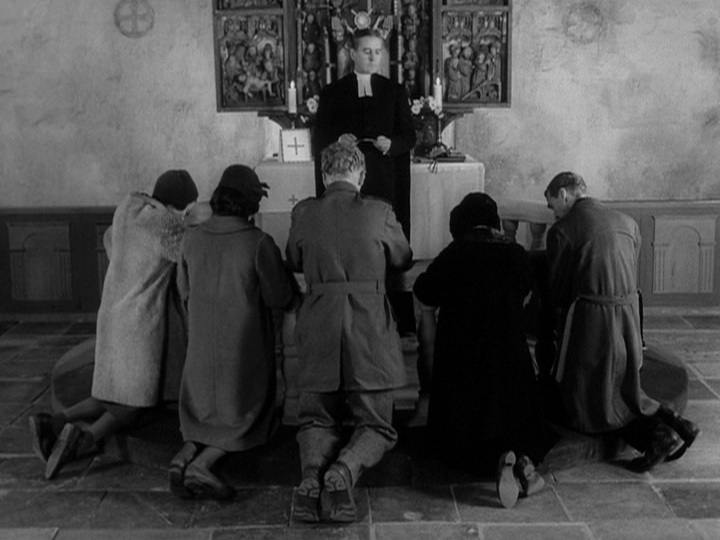 As the movie opens, Ericsson is presiding over a service for a congregation of eight, including a deacon, the hunchbacked sexton, and Ericsson’s former mistress, who is an atheist. Only five of the eight take communion. This is going to be a rough day for Ericsson. He is coming down with a cold – his fever is increasing, and he still has to fill in for communion at another church later that afternoon. 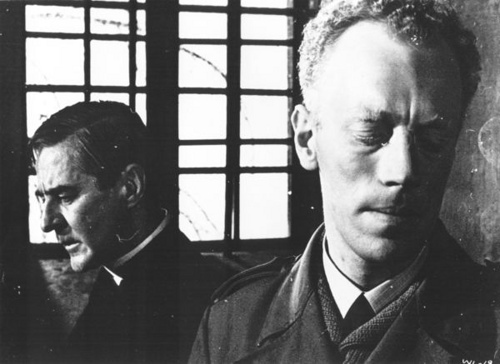 His mistress is pressuring him to get married, and two of the people at the sparse service, the Perssons, a fisherman (Max von Sydow) and his pregnant wife (Gunnel Lindblom) visit him afterwards. Persson has been consumed of late with fear after reading about the Red Chinese developing nuclear capabilities. The sensationalist article he read stated that the Chinese are raised from infancy to know nothing but hate, and he is crushed by knowledge of sure, ultimate doom. The former mistress, Marta (Ingrid Thulin) flits in and out of the morning, fussing over Ericsson’s health. While waiting for Persson to return for a private conversation, Ericsson reads a letter Marta wrote him, and here we have but one of many reasons Bergman was considered a master: the letter is not delivered to us as a voiceover, but a single close-up, nearly six minutes long, of Thulin speaking the contents of the letter directly to the camera. Like Ericsson, we are trapped in the room with it, and Thulin’s delivery (and needless to say, Bergman’s writing) is so good our minds never wander, as Marta details what went wrong with their relationship, their mutual complicity in its dissolution, and why they should get married and take care of each other. Drained, Ericsson falls into a fitful sleep at his desk until Persson arrives. Ericsson gets right down to matters. “How long have you thought about killing yourself?” But as the conferences goes on, the pastor finds his own spiritual gas tank long exhausted, and he can find no comfort to offer the fisherman, only his own misgivings about the very existence of God, a disjoint that began when he was unable to reconcile things he saw during the Spanish Civil War with his concept of the Almighty. 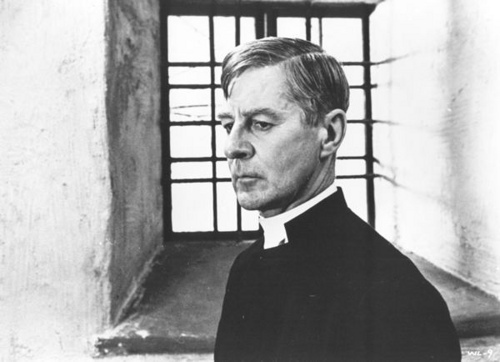 Persson, discomforted by this outburst from a clergyman, excuses himself and leaves. Marta is still waiting for him in the sanctuary. “Now I’m free,” he tells her, but Marta’s relief that he finally agrees with her views on God is cut short by another member of that wan congregation arriving to tell Ericsson that Persson has blown his brains out down by the river. The day is far from finished with Ericsson. He will sit with Persson’s body until the morgue arrives to claim it. He will deliver the sad news to Persson’s pregnant widow and three children. He will, once and for all, tell Marta how he feels about their relationship, the bookend to her earlier letter, but delivered face-to-face; and he will preside over that evening communion, a service for the only person in the church- Marta the atheist, praying for the ability to understand and somehow get through to Ericsson. So yeah, Winter Light can be used as Exhibit A in the cultural cliché that “Swedish movies are depressing”. 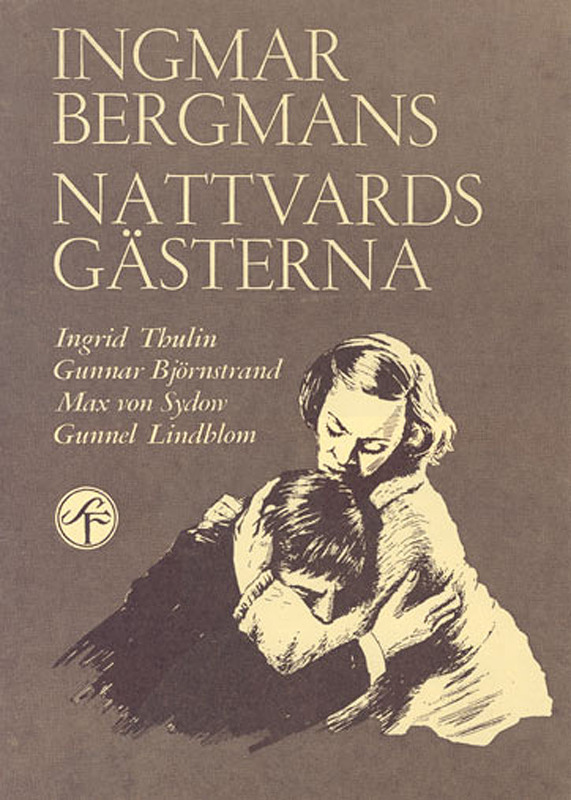 The film’s title in its native Swedish, Nattvardgästerna, translates to “The Communicants”, a clever title of double meanings; not only are our main characters involved in one of the loneliest sacraments ever performed, but each has their own problems with communication, a very common thread in Bergman films, alongside another: a protagonist so obsessed with finding proof of his own personal version of God, he is blind to every other possibility of God’s nature and existence. The English title, Winter Light, is also brilliantly multi-faceted. 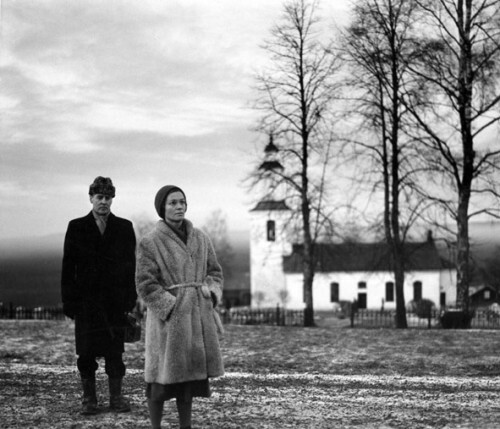 The lush detail of Bergman’s earlier movies is here stripped away, and Sven Nykvist, behind the camera of what I think is only his third Bergman film, emphasizes the isolation and bleakness of life under the gray winter skies. There is one literally radiant moment, after Persson takes his leave of the distraught pastor, and in the window behind Ericsson, the sun very briefly breaks through the clouds as the clergyman has a moment of clarity about his relationship to a God that may not even be there. This leads to the “I’m free” moment, but the clouds close again, the news of Persson’s suicide is delivered, and uncertainty again takes hold. These are words that must touch Ericsson, and touch him deeply. He makes the decision to hold the service, because no matter what, there must be Communion. There must be duty. So I say watch the movie, but be prepared for what it is: a stark portrait that may serve as a mirror when you least expect it. So after such an effervescent, frothy confection, you’d think I’d go for a comedy or a movie where things go boom, but no, I still had a commitment to quality in May (oh, I had such plans for the month! ), so my next stop was Akira Kurosawa’s High and Low. I’ve seen all of Kurosawa’s samurai flicks – hell, The Seven Samurai was the movie that drew me into my love for film, at 13 or 14 years of age. But those are such a small part of the man’s output, I’m doing him a great disservice. Perhaps I started at the top with Ikiru, but I still have a long trail to walk. There are worse problems. 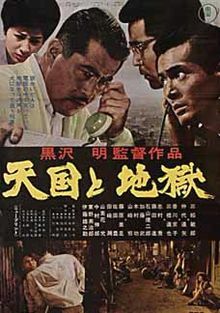 Kingo Gondo (Toshiro Mifune) is a successful executive who, on the verge of a risky corporate takeover, is plunged into a dilemma: a kidnapper, attempting to abduct his son, has instead gotten his chauffeur’s child. The kidnapper doesn’t care, he still demands thirty million yen for the boy’s release. The dilemma is that Gondo is mortgaged to the hilt for the takeover, and if he uses that money for the ransom, instead of the controlling stock of the shoe company where he works, he will be ruined financially. That is the moral quandry that drives the first act of High and Low, and the phrase “first act” has never been more appropriate. Shot almost entirely in Gondo’s spacious living room, with a hilltop vista of Yokohama, Kurosawa rather famously rehearsed and blocked this segment like a stage play, and shot it in long takes. It’s fascinating to watch how this allows Kurosawa to manipulate the negative space around the embattled businessman as he steadfastly refuses to be destroyed for a child that is not even his own. His bubble of isolation expands and contracts, it is violated by his wife and the poor, bereft chauffeur. Eventually, he decides to do the right thing and pay the ransom, and the bubble collapses. The second act lets us out into the world, as Gondo performs a complicated drop of two briefcases stuffed with money, and the police do what they can to identify the people involved. Settle in for the third act, which is a very good police procedural – the cops trying to recover the money before Gondo defaults on his loans, and falls from the grace of his hilltop house. High and Low is based one of the 87th Precinct novels by Ed McBain, aka the prolific Evan Hunter, King’s Ransom. I enjoy those novels, and the source material shows through in the characterization of the cops. Tatsuya Nakadai makes for a cracking Steve Carella analog as the leader of the task force trying to help Gondo. The police are thoroughly professional and prepared; they arrive dressed as delivery men in case Gondo’s house is being watched, and it is. In fact, when the kidnapper calls to ask why Gondo’s curtains are closed, the cop immediately dive to the floor and behind furniture so the curtains can be opened. So yeah, I like watching Dragnet re-runs, I like the 87th Precinct novels, and the closest I get to binge watching are the Investigate Discovery murder investigation shows on Netflix. Some folks find this part of High and Low boring; I find it compelling. High and Low definitely lives up to its title, starting at Gondo’s spacious house and descending slowly into the slums of Yokohama and finally a hellish venue the cops only call “Drug Alley”. It also charts the similar fall of Gondo, who loses his house and worldly possessions, yes, but also begins to rise again. The kidnapper, a medical student living in a slum, whose window has a direct line-of-sight to the Gondo house, seems to have no motivation outside humiliating Gondo – which ultimately fails, because the court of public opinion has found great sympathy for the executive, leaving the young nihilist with nothing but a scream of rage and fear as he is taken away to be executed. 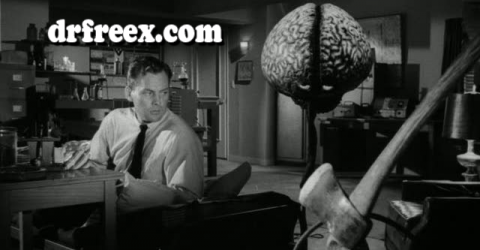 I can sure pick the uplifting movies, can’t I? Thanks. Entertaining and informative. Regards from Thom at the immortal jukebox.